The soothing sounds of the Little Pigeon River trickling past, the fresh Smoky Mountain air all around, the precious memories cherished for years to come…A River Song is waiting for YOU. 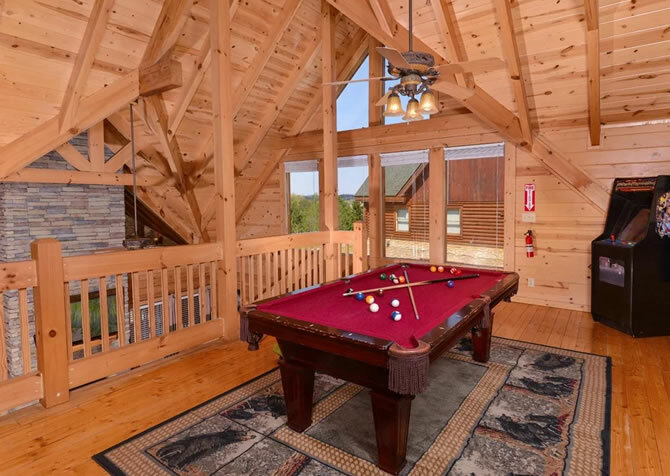 This 3-bedroom, 4-bathroom, riverfront cabin for 10 in Gatlinburg, Tennessee, boasts a large private deck with a serene river view, 3 gas fireplaces, flatscreen TVs, complimentary Wi-Fi, a fully equipped kitchen, and a game room with foosball and pool tables. 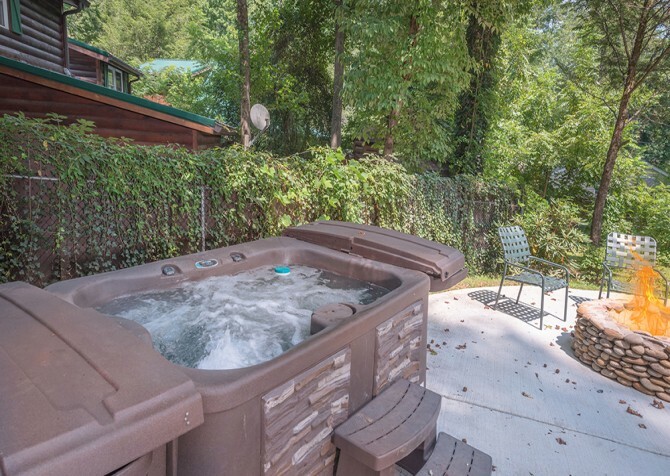 Spend mornings sipping coffee in the outdoor dining space, afternoons playing in town (within walking distance), evenings grilling up a barbecue feast on the charcoal grill, and nights soaking in the bubbly hot tub. 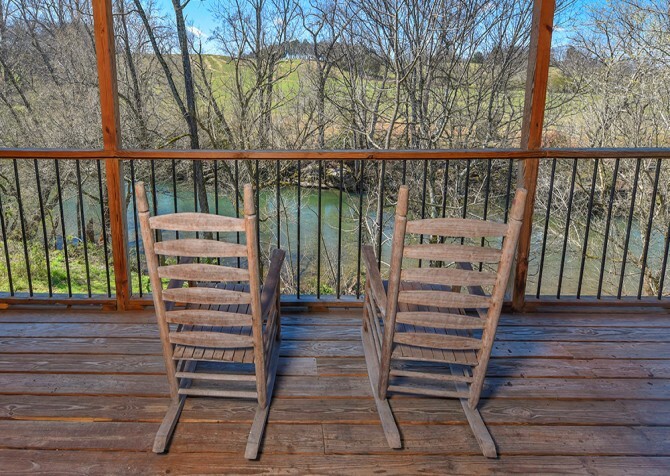 Perfect for a couples’ retreat, getaway with friends, or family vacay, A River Song will keep you and your guests comfortable, relaxed, and entertained in the Smokies. When you arrive at A River Song, head straight for the spacious living room with a plump sofa, 2 plush love seats, and a flatscreen TV. Unwind from your travels while the little ones burn excess energy with a dance battle on the hardwood floors or flip on the big game with refreshments piled high on the beautiful coffee table. Cool evening coming your way? Get a toasty fire going in the gas fireplace to provide a calming mountain atmosphere and keep everyone in total comfort. And when the gang hits the hay early, curl up for some alone time with a good read by the fire — you can finally finish that enticing book series! Charming and spacious, the fully equipped kitchen at A River Song is stocked with everything you need to prepare tasty meals in your mountain getaway. Whip up homemade dishes on the open range, bake multiple desserts in the double oven, brew a smooth Colombian blend with the coffeemaker, store restaurant leftovers in the refrigerator, and fix buttery popcorn in the microwave. Best of all, the dishwasher will take care of the mess for you! And there’s even a breakfast bar for 2, perfect for keeping an eye on the kids while you cook or enjoying an early-bird cup of joe with your spouse. Offering multiple dining spaces, A River Song keeps your options open, from a large wooden dining table for 6 plus a small breakfast table for 3 indoors to outdoor dining sets under the blue Smoky Mountain sky with a close-up view of the Little Pigeon River. There’s even a gas fireplace by the indoor breakfast table, giving you a true mountain atmosphere while you dine. And these dining spaces are incredibly versatile, meaning you can dine, play board and card games, catch up on emails, or set out arts and crafts for the kids. Up for a game tournament? Host your own in the fun rec room downstairs! Gear up to enter the foosball battlefield and keep your composure (if you can) while shooting pool. Ready to bust a move and shake your tail feathers? Turn up your favorite tunes with the CD player. There’s also a mounted flatscreen TV and a queen sleeper sofa, great for the kids and kids at heart who decide to play games and groove all night! 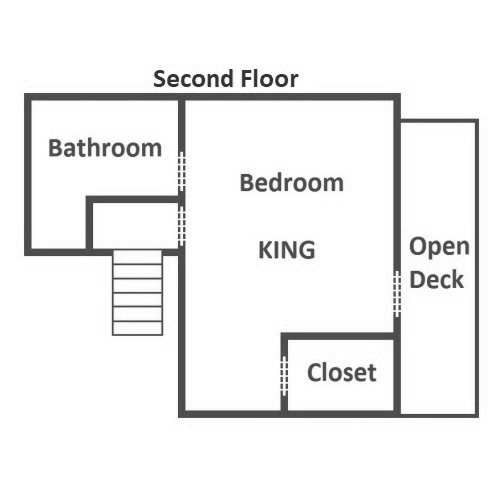 With a cozy bedroom on each level of this 3-story abode, privacy is more than possible on your group trip. Relax on the entry level’s king-size canopy bed or venture downstairs to the queen suite for a restful snooze, a midnight snack from the kitchenette’s mini fridge, or an evening read by the gas fireplace. And the upstairs master suite with a king-size bed offers a DVD player for movies from home and a private deck for 2, wonderful for romantic moments and elevated river views. There’s also a flatscreen TV in every bedroom for entertainment and 4 full bathrooms for convenience, including 2 en-suite baths. And don’t forget the 2 queen sleepers in the home for extra sleeping space, bringing the maximum guest total to 10 if you wish. After a smooth drive along flat, paved roads, arrive at the paved, motorcycle-friendly parking area for 4, leave your bags in the car, and head only 4 steps up to the front door. Once you’ve explored the inside of A River Song, step onto the large party deck for a closer view of the Little Pigeon River — you can hear the tranquil flowing water already, can’t you? And when evening settles in, barbecue burgers and hot dogs on the charcoal grill out front before digging in with family and friends in the outdoor dining space with deck chairs and tables. When the food has settled and perhaps a few foosball or pool rounds later, slip into your swimsuit for a relaxing soak in the hot tub. In the morning, grab a cup of joe and unwind in the rocking chairs before gearing up (with your Tennessee fishing license), casting your line, and catching a big one in the sparkling river! 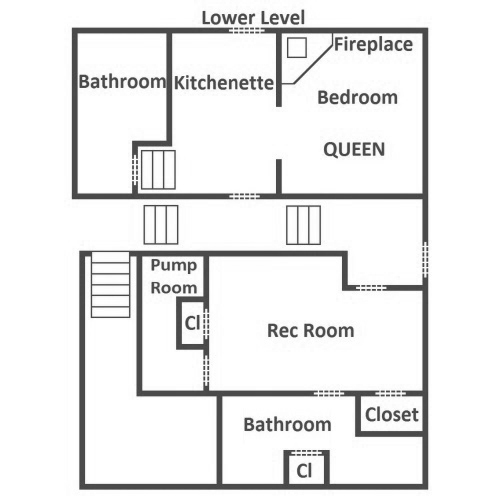 A River Song also provides a washer and dryer to keep your clothing and towels fresh, a VCR to relive precious moments of the past, and free high-speed wireless internet for streaming your favorite dramas or checking out local events. Want to know the best part of staying at A River Song? This charming riverfront cabin is pet friendly, making it the perfect place to bring your furry loved ones on vacation with you! While you'll love the peaceful river location of A River Song, you'll also appreciate being just minutes from downtown. At less than a mile from the city, you can walk to town with ease or take a short drive to play at local attractions, dine at fine restaurants, and shop for hours on end. Putt-putt to victory with family and friends at Ripley’s Davy Crockett Mini-Golf, boasting innovative and amusing courses. Speed through the trees, over high hills, around sharp turns, and down the mountain aboard the Gatlinburg Mountain Coaster! Waddle with the penguins, splash with the rays, and explore underseas at one of the top-rated aquariums in the country! "What an amazing place! 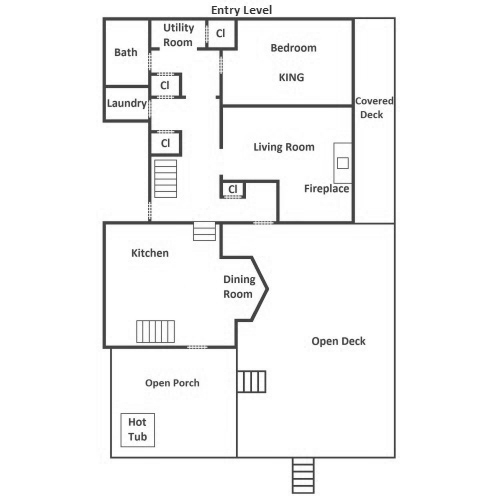 This house has a ton of space and is very comfortable. 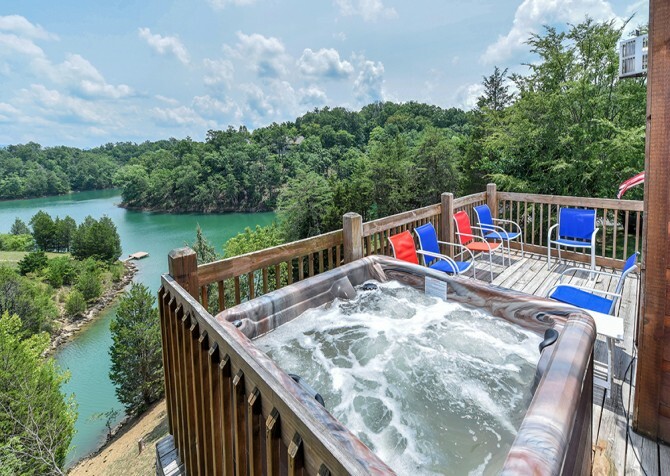 The location is perfect, it's far away enough for ultimate privacy and yet still in walking distance to everything in Gatlinburg and the river is icing on the cake. I highly recommend this place to anyone planning a trip here." 4th of July Parade & Fireworks!